Mobile gaming used to mean Game Boy, PSP, Nintendo DS — another device to carry around that usually couldn't replicate the experience of a home console. Well, those days are over. High-quality, powerful games are now available on the phone you already have in your pocket. Whether you have an iPhone, Samsung Galaxy, or OnePlus phone, you probably have a gaming machine on hand. But what if you're in the market for a gaming phone? Which phones are specifically best for those AAA titles like Modern Combat 5, Minecraft, and Pixel Gun 3D? And what makes a good gaming phone anyway? Well, we wanted to know, too. So, we did what anyone with access to the best smartphones around would do — we tested them all. Check out our chart below to compare the four best smartphones for gaming, then read up below to find out why each is an excellent choice for gaming on-the-go. Note: This list was updated in December 2017, which knocked out older contenders such as the OnePlus 5, Samsung Galaxy S8+, and Essential Phone. To rate these phones, we considered a number of criteria within four main categories. If you have any questions about the data in the chart while reading through the individual phone sections below, simply reference this section for more details. Otherwise, skip ahead to the Phone 1 section to see the good stuff! Screen Size: We ruled out any phone whose screen was smaller than 5.5 inches. That's not to say you can't have a great experience on a smaller screen, but, in our judgment, larger screens are better for gaming. Resolution: You won't find any device with a display resolution under 1080p on our list. As is customary when rating resolution, we've only listed the width of the display, rather than the height. For example, phones will be listed as 1080p rather than 1920 x 1080. Screen Type: We only allowed devices with either an AMOLED or IPS LCD, because other display types cannot match the brightness, colors, or viewing angles AMOLED or IPS LCD provide. Some chide companies like Apple for still using IPS LCD over AMOLED, but IPS LCD can nevertheless achieve a fantastic viewing experience. SoC: The SoC, or system on a chip, contains the phone's CPU and GPU, which are the two main processors when it comes to gaming. Many times, you will see that phones using the same SoC have the same CPU and GPU specs, but occasionally, that isn't the case. OEMs will sometimes throttle the CPU if they notice performance, battery, or heat issues stemming from the CPU. CPU: The Central Processing Unit is what handles much of a smartphone's programming. Its clock speed, which is the GHz number you see, indicates how fast, in theory, the unit can process information. While it's tempting to simply compare the numbers to see which CPU is fastest, you never really know until you run a true test. GPU: The Graphics Processing Unit handles the on-screen graphics and visuals for smartphones. GPUs, in general, are much more efficient at rendering and processing graphics than CPUs, so having a solid GPU is essential for good gaming performance. Max RAM: Random Access Memory is what allows your smartphone to "remember" multiple actions and states at the same time. In theory, the more RAM, the more your phone is able to handle at once without having to reload or make you wait when switching actions. While not the most essential aspect to mobile gaming, more RAM will allow you to run more complex games, as well as run multiple games at the same time. Max Internal Storage: This indicates how much storage you can get built into each smartphone. This spec is important, since the more storage you have, the more games you can download. We didn't include data for Android devices with expandable storage options since the OS does not allow you to store game files on an SD card without some serious tinkering. Battery: Here, we list the battery size in milliampere hours (mAh) for each device. The larger the battery, the longer the phone can stay powered on, right? Well, not exactly. Factors such as screen size and resolution, chipset, and more can mean a phone with a larger battery actually dies faster than a phone with smaller battery. Everything counts. Speaker Placement: Simply put, this is where the phone has its speaker(s) placed. This is an important consideration for how your games will sound, and how your hands may or may not get in the way when playing. Storage Occupied by System: This is the amount of internal storage you don't have access to thanks to system files. We list that data in a percentage here, since, for example, an iPhone with 128 GB internal storage has the same percentage reserved for system storage as a 256 GB model. OS Skins: Your Android device might not be running pure Android. Some OEMs manipulate Android on their devices with their own "skin," or a sort-of hybrid OS. The most famous example of this is Samsung's TouchWiz, but more on that later. Game Mode "Game Mode" varies across systems, but in general, we're looking for a specific setting on a phone that makes the device more oriented for gaming. This could be as simple as muting notifications and disabling soft keys, or as complex as enhancing phone performance. Mute Alerts: We judged how easy or difficult it was to mute alerts using software settings on your phone when playing games. In general, a phone with a game mode made it very easy, while those without made for a difficult process. Optional Performance Boost: This feature enhances the performance of the smartphone in question for a better gaming experience. However, performance boosts can come with certain drawbacks. Keep reading to see why. Frame Rate Control: I see this as an important feature for bringing mobile gaming onto the same level as PC gaming. Giving players the ability to set frame rate limits gives them more control over their games and their performance. We're playing on powerful devices, now. Apps for Cheating: These are apps that help you — shh — cheat, whether that be cheat codes or walkthroughs. We looked at which platform has more of these kinds of apps. App Curation: We looked to see how carefully Android and iOS monitors the apps that end up of their respective stores. This is important for a long list of reasons, but mostly to prevent cloned games and malware from impersonating legitimate games. 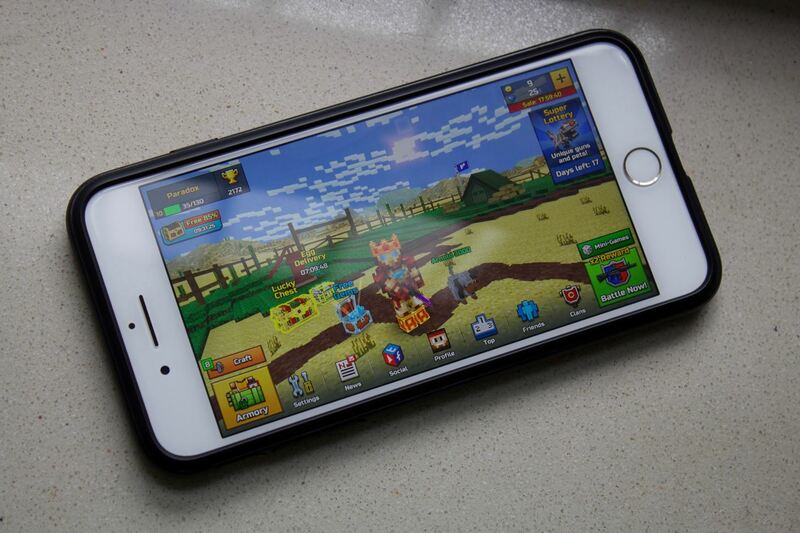 Offers Emulators: While many people think of mobile gaming as titles developed specifically for iOS or Android, emulators make your device really feel like a portable gaming system. These can be used to play games from many home consoles. Gets Most Initial Releases: There are differences in the ways that iOS and Android receive initial releases. We looked at which platform really does get the most, and the general assumptions are true — iOS does get more new game releases than Android. Battery (Video Test): We looked to GSMArena's battery tests for our data. Unfortunately, it's a little difficult to accurately test batteries while gaming, so GSMArena's video tests serve as the next best thing to see how these phones perform under heavy use. 3DMark Score: 3DMark intensively tests your smartphone's CPU and GPU capabilities. It's a good way to compare benchmarks across smartphones. Geekbench 4: Geekbench 4 gives us some more details on each smartphone's CPU, in terms of both single-core and multi-core processing. Single core processes are important for simpler programs and executions, while multi-core processing comes into play for most complicated and intense games. Antutu: Antutu's benchmarking test will give you a combined score based on, among other things, your CPU, GPU, and RAM. Ergonomics: This one's simple — how comfortable is the phone to play on? It's a subjective measurement, but one that you'll certainly want to consider for this use-case. The phones we chose for our list needed to hit a list of qualifications before we even considered them for our article. Firstly, we ruled out any phone without a screen size of at least 5.5 inches. We believe that while you can have great gaming experiences on a smaller display, phones with larger displays give you a much more immersive experience. That's also why we required those displays to have resolutions of at least 1080p and to be either AMOLED or IPS LCD. Other types of displays just cannot provide players with the same level of color, brightness or viewing angles. We also made a point to exclude any device that did not feature the latest top-of-the-line SoC, which, at the time of our testing, was the Snapdragon 835 or the Apple A11 Bionic. While there are many capable gaming phones that don't have these chips, the ones that do simply outperform those without. We ruled out any device with capacitive keys that couldn't be disabled. Unfortunately, while these keys have their merits, they are far too easy to hit accidentally while gaming, which can interrupt or ruin your gameplay. If the phone did not at least have an option to turn these keys off, we had to exclude it from our list. These ground rules immediately ruled out some really great phones. The iPhone 8 (small screen), Sony Xperia, HTC 10 (small screens/missing Snapdragon 835), Axon 7 (capacitive keys/missing Snapdragon 835) didn't make the cut, while the Pixel XL, LG G6, LG V20, and the Blackberry DTEK60 narrowly missed out for not having the latest top-of-the-line SoC. Finally, there were a few phones that had sibling devices which could have made the list, but we opted to exclude them and go with the best gaming phones made by each manufacturer. For instance, the iPhone 8 Plus' bezels make it more comfortable to hold than the iPhone X, and all other key internal specs are the same. As for the Galaxy S8 and OnePlus 5, Samsung and OnePlus have newer phones on the market that make a safer bet. While each device on our list is weighed by the points below, it would be a bit redundant to include this section on each phone review, since each Android device would have the same answer. So, you can conveniently find these answers here, in a de-facto section about whether iOS or Android is better for mobile gaming. For anyone who wants to recreate the days of Game Genie, Google Play has you covered. The store has a myriad of apps dedicated to tips and cheat codes for certain games, although you should read the reviews carefully, as many appear to be scams. While iOS does have a handful of these types of apps, there is an apparent lack of content when compared to Android. Unfortunately, Android does not curate the Google Play store as well as iOS. While Apple is no stranger to fake games and scam, these nefarious apps are even more common on Android. Be careful out there when downloading games — make sure the game you want is actually the one you download. What Android has over iOS, however, is emulation. Without even needing to root your phone, Android users can sideload emulators on their devices. Your Android device can be turned into a makeshift GameBoy, but also a portable Nintendo 64 or a PlayStation. If only the you from the '90s were here to see this. While Android may be more compatible with emulated games, when it comes to current mobile games, iOS takes the cake. It's just a fact that game developers release games and updates for iOS before Android, and while it makes me sad, that's a reality we face here. There are only, at any given moment, four iPhone models currently sold by Apple, while there are dozens of Android devices out there. It's just easier to develop for iOS as a whole. Razer popped onto the scene this year with its first smartphone, making waves for one very unique feature — a display with a refresh rate of 120 Hz. This makes your games look super smooth, which helps with both gameplay and immersion. But Razer's first flagship isn't just about the display — this gaming phone has so many excellent features that it makes it to the very top of our list. Let's get it out of the way — that display is incredible. 120 Hz is something you need to see to believe. Motion has never looked better on a smartphone, and while native support for the refresh rate is still lacking, this technology is the next big step in mobile gaming. Bringing things down to a level where we can compare to the other smartphones on this list, the Razer phone has a 5.71" IPS LCD. With a resolution of 1440p, your games are gonna look super crisp. Of course, a proper gaming phone deserves some proper internals. The Razer is rocking the Snapdragon 835, 2.35 GHz processor that we've come to know and love. Your graphics are powered by the Adreno 540, just like the other Android phones on our list, so you know your games are in good hands. While internal storage on the Razer phone is limited to just 64 GB, that's compensated for by the massive 8 GB of RAM. Speaking of massive, the Razer phone comes with a 4,000 mAh battery. But, as you'll learn later, that doesn't mean it even comes close to the best battery life on our list. The Razer phone contains two speakers, which is awesome. However, they are positioned directly on the bezels, meaning you can potentially cover them with your thumbs while playing. These are the only dual front-facing speakers on our list, though. There's nothing better than having your sound actually directed at you! Luckily, you mostly get a stock Android experience on the Razer. The company only includes Nova Launcher as a third-party addition. You shouldn't notice this get in the way of your gameplay — if anything, the extra flexibility it affords may help. 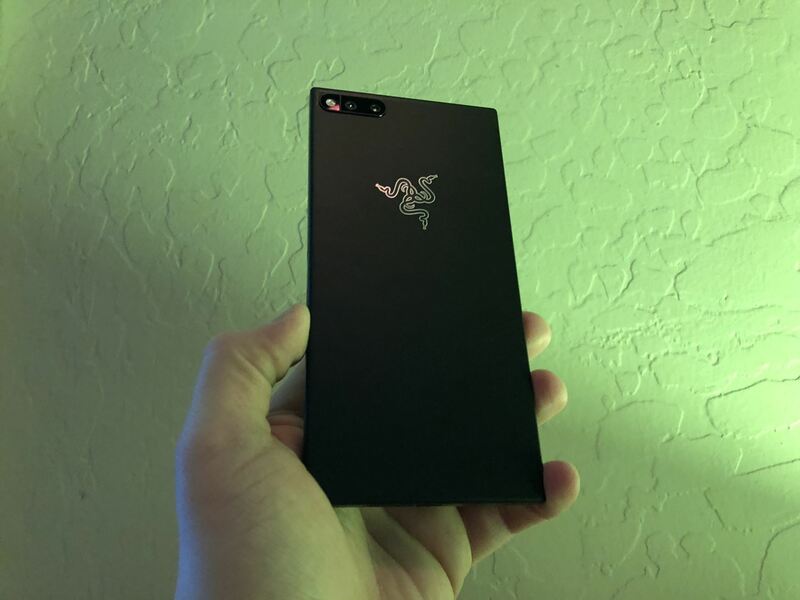 Considering Razer made its name in desktop gaming, you expect their phone to have some gaming features built right in. You have a Game Mode, which makes it easy to mute alerts. Razer also includes performance boosts, which allows you to control the CPU and frame rate for each game. I really like this feature, because it feels like mobile game developers are treating mobile gaming as seriously as PC gaming. These are serious devices, and should be treated as such. Since they can handle games at varying frame rates, consumers should be able to customize their gaming experience. Remember that 4,000 mAh battery? While it's the biggest on this list by far, it performs the worst. According to a GSMArena test, the Razer doesn't even make it to hour seven before powering down. That's disappointing, but considering the intensity of that display, it's no wonder the Razer lags behind in battery longevity. The Razer scored well in performance testing. Its single core Geekbench score came in third at 1,931, but came in second for multi-core and 3DMark at 6,728 and 3,643, respectively. Its Antutu score came in third at 179,357. You might find it surprising that the number one gaming phone on our list didn't come in first in any performance testing. However, numbers aren't everything. When you fire up a game on the Razer phone, especially one that works with the 120 Hz display, you'll see why it's the top gaming phone of 2017. It even tops the list as one of the most comfortable phones to play on, due to its NES-style shape. If you're looking for the best gaming phone out there, you should have no reservations picking Razer. The iPhone 8 Plus is a total gaming powerhouse. From the top-notch internals to its extensive game catalog, the iPhone 8 Plus is one of the best gaming phones you could buy. If you don't mind the bezels, find out below what makes the iPhone 8 Plus so good. The iPhone 8 Plus still has that classic iPhone look, for better or worse. Its top and bottom chins, in addition to the 5.5-inch display, mean this is a big phone. The IPS LCD 1080p display isn't quite as crisp as some other devices on our list, but don't be fooled — this display looks great. Apple's A11 Bionic chipset also packs a real punch, blowing the current competition out of the water. The hexa-core CPU may not initially sound as impressive as some of the octa-core CPUs out there, but this processor is fast. Combine that with the impressive Apple GPU, and you have the potential for exceptional performance, even with only 3 GB of RAM. The iPhone 8 Plus shines in terms of internal storage. While critics mock the iPhone's lack of expandable storage, users can opt for a 256 GB model, which is just as much internal storage as the top Android devices on our list, and more than enough room for all the games you can download. If you choose to save a little money, the baseline 64 GB model isn't too shabby, considering many Android flagships max out at that storage capacity. The 8 Plus' battery on the other hand, while only 2,691 mAh, is actually pretty decent. More on that later. For gamers who like to play without headphones, the iPhone 8 Plus provides an excellent dual-speaker experience. There is one speaker on the bottom as well as one placed behind the receiver. Just be careful not to cover either with your hands, and your games will be louder than ever. So, Apple likes to use up your internal storage for the system (but that's no secret). However, with the iPhone 8 Plus and iOS 11, that system storage doesn't take up much room. At 11.9%, the iPhone 8 Plus uses less internal storage than any other phone on this list. Not bad, Apple. One nice aspect to Apple producing its own hardware and software is a lack of OS skins. Your iPhone 8 Plus will ship with 100% iOS and nothing else. However, the advantage over Android ends here. Apple doesn't include any sort of game mode in iOS, meaning you must change your notifications settings if you want a disturbance-free gaming session. That's a pain. Combine that with a lack of performance modes and frame rate control, and it seems like Apple doesn't think about its gamers as much as Android does, even with native screen recording built into iOS 11. These features don't hinder gaming on an iPhone, but I'd like to see Apple pay more attention to the gaming community, considering many choose iOS in particular for mobile gaming. Okay, let's be honest. I love Apple, but iPhone batteries are usually bad. Luckily for iPhone 8 Plus users, that's not necessarily the case. According to GSMArena, the iPhone 8 Plus will last for 14 hours and 55 minutes while playing video. While not the best performance on this list, that's still more than half a day of continuous usage. The iPhone 8 Plus performs well on all other tests, as well. Its 3D Mark score is a little low at 2,698, but it crushes the single core test with a score of 4,232. Seriously. The iPhone 8 Plus will undoubtedly run simple games faster than any other phone on this list. In the past, the same couldn't be said for multi-core. Not so today. The iPhone 8 Plus dominates this list with a multi-core Geekbench score of 10,032. With an Antutu score of 188,726, this iPhone is the most powerful gaming device on the market. Now, the iPhone 8 Plus can get pretty hot. In fact, it was the hottest phone on our list, maxing out at 93° F. If you're playing a particularly demanding game, especially an online multiplayer game, watch out for the heat! Finally, let's talk about comfort. The iPhone 8 Plus is a comfortable enough phone to game on. However, compared to other phones on this list, the 8 Plus can feel a bit ... bulky. It's really big, but also really thin, which can result in an odd feeling in the hands after a long period of time. Look — choosing an iPhone over the other phones above is more than just picking the best phone for gaming. iOS is a different beast than Android, and you have to take that into account when going with the iPhone 8 Plus. That being said, the iPhone 8 Plus is an amazing phone for gaming. If you're someone who likes iOS, or is interesting in it, and wants a gaming phone that gets the latest updates and games, the iPhone 8 Plus is definitely for you. Essential's screen size and resolution are not quite as even as the other phones on this list. Essential boasts a 5.71-inch display with a resolution of 1312p. Essential decided to go with an IPS LCD over an AMOLED like so many of its competitors, however, it looks excellent. The Galaxy Note 8 is Samsung's most ambitious flagship to date. While the Infinity Display is what really stole the show, it's not necessarily what makes the Note 8 such a great mobile gaming device. Samsung made sure the Note 8 was packing some serious internals to support the newest and most demanding games of 2017. Let's start with the obvious: the Note 8 has a giant, gorgeous AMOLED display. Coming in at 6.3 inches, the Note 8 has one of the most impressive smartphone displays on the market. Here's the thing though — its shape doesn't quite fit the traditional 16:9 ratio most game developers work in. Some have optimized their games to fit the Note 8's display, but many will leave you to decide between zooming the game to fit the screen, or leaving black bars on either side of the display. That's not necessarily a bad thing — the additional black bars on the edges of the screen actually make for a comfortable grip while playing. On the other hand, zooming in on the game leads to some truly immersive experiences, although doing so will cut off the game's edges. All things considered, the Note 8's screen is excellent for gaming. With a resolution of 1440p, your games will look sharp. You're not going to have a problem with performance on the Note 8, considering the power Samsung has placed under the hood. A Snapdragon 835 SoC will keep your gaming buttery smooth, coupled with both an octa-core 2.35 GHz processor and the Adreno 540 GPU. The Note 8 ships with an impressive 6 GB of RAM, along with up to a massive 256 GB internal storage partition. You shouldn't have any trouble with storage management here — download games to your heart's content. The Note 8 ties another phone on our list for second biggest battery at 3,300 mAh, which leads to some exceptional battery life (more on that later.) A bottom speaker placement is a bit disappointing, but, again, not terrible. Samsung limits the system software taking data away from your games library. The Note 8 requires 17.3% of your internal storage, leaving the rest up for you and your games. Arguably the Note 8's biggest detractor as a gaming phone is in its OS skin. Samsung insists on installing Samsung Experience (better known as TouchWiz) on its devices, which is, for lack of a better word, annoying. 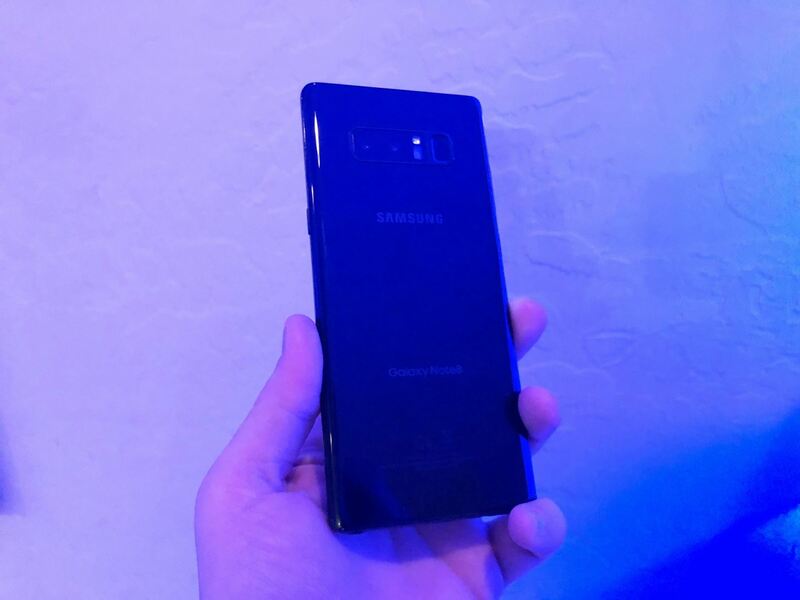 Stock Android would make the Galaxy phones almost unreachable, but if you require a stock experience, Samsung Experience certainly won't provide that for you. While TouchWiz has its aforementioned downsides, it is undoubtedly made with gamers in mind. Like the OnePlus 5T, the device has a game mode, which includes easily muting your alerts, but also includes a performance boost. Mind you, that involves pulling the screen resolution down to 1080p, but your games will run as fast as possible. It may not be the "performance enhancements" you'd find by overclocking a processor on a PC, but it's nice to see Samsung focused on what gamers need. The Note 8 has built-in screen capture thanks to Google Play Games, and select games will allow you to set the frame rate limit. It pays to be a high-end Android user. So, back to that battery. Just in terms of sheer size, it comes in second for battery life. GSMArena's testing shows the Note 8 able to play video for just over 15 hours before kicking the bucket. Not bad at all. While the Note 8 isn't quite the highest performing smartphone on this list, its numbers are still impressive. However, it scored the highest on our list with the 3DMark test at 3,745. Geekbench 4 testing shows a 1,862 and 6,590 for single core and multi core performance, respectively. Surprisingly, the Note 8 Antutu score of 175,153 is the lowest on our list, but, of course, benchmarks never tell the whole story. In real world performance tests, the Note 8 is a highly competent gaming phone. That, coupled with how comfortable it is to hold for extended periods of time, makes the Note 8 one of the best gaming phones you can buy. Despite the OnePlus 5 coming out earlier this year and topping our list when it did, the 5T is an excellent, if but slight, improvement over that effort. While it sits at number four on this list, that by no means indicates there is something wrong with this phone. In fact, it truly is one of the best you can buy for your gaming needs, especially considering it is the cheapest by far on this list. The OnePlus 5T's new 6.01" edge-to-edge screen makes for a great viewing experience, and while it is not the sharpest on this list, its 1080p display is more than crisp enough. OnePlus, like most OEMs on our list, included an AMOLED display with the 5T, which looks great from all angles. When we say the OnePlus 5T is a machine, we mean it. Inside, the phone is rocking a Snapdragon 835 SoC, and, while it isn't the only phone to include Qualcomm's latest and greatest, it does have the fastest clock speeds on this list. Your gaming will feel blazing fast, thanks to the octa-core 2.45 GHz CPU, coupled with the respectable Adreno 540 GPU. Most phones cannot match the OnePlus when it comes to its 8 GB of RAM, more than double the RAM of the iPhone 8 Plus. While RAM isn't the most important piece to a gaming phone, you won't have any problem handling multiple tasks here. Your OnePlus comes with up to 128 GB of internal storage, allowing you to download a plethora of great games. With a 3,300 mAh battery, you'll be playing those games all day, but more on that later. The OnePlus features one speaker located on the bottom of the device. It's a bit of a bummer for anyone who prefers a dual speaker setup, and can be easily blocked by your hand while playing. If sound is important to your gaming experience, I'd recommend headphones. The OnePlus 5T is one of the best Android phones on the market, and part of that comes from how OnePlus, the company, interacts with the OS — very little. OnePlus' Oxygen OS is a very light OS skin that respects Android without bogging down system resources or processing power. You won't get 100% stock Android here, but it's about as close as it gets. That's not to say OnePlus doesn't include useful features that work with the OS to give you a better gaming experience. OnePlus 5T devices come with a setting called Gaming DND mode, which both mutes notifications as well as disables soft keys, allowing you to have an uninterrupted game session. Unfortunately, OnePlus does not include a performance boost mode, but since its specs are top-notch, it's not a feature that is overly missed. However, thanks to Google Play Games, the OnePlus has native screen recording, so anyone looking to share their gaming sessions with the world will have no trouble here. 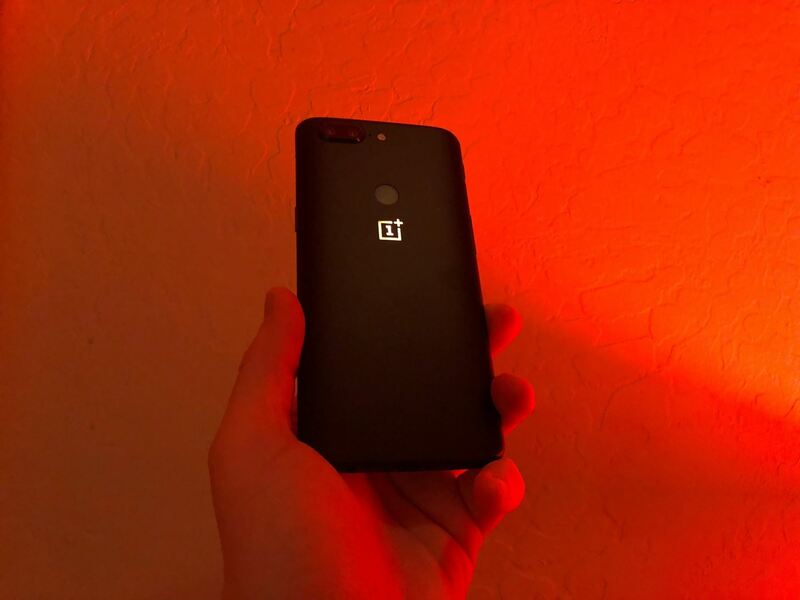 Like the other Android phones on this list, certain games for the OnePlus 5, such as Modern Combat 5, allow users to control the frame rate limit. Thank goodness for customization. The OnePlus 5T dominates the competition with its exceptional battery life. While we could not find a reliable test for the OnePlus under gaming conditions, GSMArena found the device able to play 16 hours and 49 minutes of video before finally powering down. The OnePlus also impresses when it comes to benchmarks. Its single core Geekbench and Antutu scores come in second, at 1,960 and 179,790, respectively. 3DMark and multi core Geekbench scores come in third at 3,507 and 6,701, respectively. The only area the 5T can fall short in is comfort. While not uncomfortable, its ergonomics aren't perfect for extended periods of gameplay, at least compared to phones like the Razer or the Note 8. Still, it's an excellent gaming phone in its own right. Honestly, it's really hard to pick a winner out of the options on this list. Sure, the Razer Phone edges itself to the top with its refresh rate and top-notch specs, but the Note 8 and OnePlus 5T are blazing fast phones in their own right. The iPhone 8 Plus, while missing some awesome features found on Android devices, is still an amazing gaming phone, not to mention that the mobile gaming industry tends to favor iOS over Android. All in all, you really can't go wrong with any phone on this list. If you want stock Android, go with the Razer Phone or OnePlus 5T. If you want to make sure you get the newest updates and games, try the iPhone 8 Plus. If you want a phone that clearly was designed with gamers in mind, check out the Note 8. The point is, get out there and play! What do you think of our list? Which phone do you think is best? Did we leave out one of your favorites? Let us know in the comments below! Hi, first of all, it's a great article. I want to know why you didn't consider Pixel 2 and LG V30. Also, if i remember right, Essential PH-1 was in the list before the update. If it isn't here now, am I right to assume these 4 phones in the list are "better"? We considered both the Pixel 2 XL and the V30. These are fantastic phones with great specs, but the phones on our list outperform those two in testing, such as Geekbench and Antutu. That's not to say these are necessarily worse gaming phones, however, for our purposes, we had to draw a line for the list. The same can be said for the Essential PH-1. It's a great phone for gaming, however, the inclusion of the Razer phone ended up bumping it from the top four.